The North American T28 series of aircraft were developed just after World War 2 as an all-through trainer aircraft for the new breed of jet machines that were coming into service. To achieve this, the aircraft was deliberately under-powered by having an 800hp Wright R1300 engine fitted, which gave the aircraft the rather sluggish take off performance of those early jets. The USAF, having taken delivery of some 400 of these early models, having found them a little expensive to operate, decided to adopt the Beech T34 mentor as its standard trainer, and placed all of its T28A aircraft into desert storage. In the meantime, the US Navy started to search for an all-through trainer that could provide a means of giving its students basic and advanced flight training and also of qualifying them in carrier landings. Thus were born the T28B and C models for the USN that desired an aircraft with a more meaningful performance and who asked North American if the Wright 1820 series of 1425hp engine could be fitted to the aircraft. The new power plant transformed the machine, giving it a similar performance to the legendary P51 Mustang, yet with its nose wheel undercarriage and large tandem cockpit, making it a relatively easy aircraft to fly. At this stage, in 1957, the French Air Force arrived on the scene with a need to find an effective ground attack aircraft to replace their T6G trainers that were being utilised in the very nasty guerilla war being fought in Algeria. The French approached the North American aircraft company in a bid to purchase T28B aircraft but were told that the entire production line was dedicated to the USN. However, they were also told that there were T28A models suitable for modification to in desert storage, and the French purchased 147 of this type and arranged for them to be shipped to Sud Aviation at St Nazaire for modification into ground attack machines. This programme was hugely successful, and by early 1960, no less than 100 T28 'S' aircraft had been shipped to Algeria, where their presence brought a speedy end to the conflict. The aircraft were fitted with two hard points beneath each wing, which carried 2 X 12.7mm machine guns and up to 36 rockets or a bomb load equivalent. The success of this aircraft type in French service was noted by the Americans who promptly converted many 'A' models and also built approximately 400 T28'D' models for ground attack and counter-insurgency (COIN) work. They were mostly used in Vietnam where the type could carry 4 tons of ordinance and proved very effective during the early stages of that war. She was complemented and finally replaced by the Douglas A4 Skyraider in that theatre, but soldiered on with the Laotian and Cambodian Air Forces. After service with the French Air Force, T28'S' Fennecs were sold to Morocco, Brazil, Argentina, Uruguay and Haiti where they proved most useful in various small conflicts. The aircraft was built by the North America Aircraft Company to meet an order from the USAF in 1951. It rolled out of the company�s Downey plant on 8th October, 1952 as a T28A, and was accepted by the USAF on 29th October, being delivered to Training Command on 10th November, 1952. She was assigned to the 3525th Pilot Training Wing at Williams AFB, Arizona, and on 6 March 1953 was involved in a mid-air collision with S/N 51-7524. The aircraft was successfully flown back to base, but the pilot of the other T28A baled out and that aircraft crashed. The aircraft was repaired and loaned to the 3505th Wing at Greenville AFB, South Carolina in June, 1953, returning to the 3525th in January, 1954. She was then moved to the San Bernardino Air Material Area at Norton AFB in November, 1954 and then assigned to the 3300th Pilot Training Squadron, Graham Air Base, Florida, in December 1956. In March, 1957 she was placed in temporary storage at Davis-Monthan AFB in Arizona before returning to the San Bernardino Air Material Area at Ontario, California in June. That August, she moved once again to 3345th Technical Training Wing (ATC) at Chanute AFB, Illinois where she remained for a year, until being moved to the 3320th Technical Training Wing at Amarillo, Texas. In January, 1959 she was re-assigned to the Amarillo Technical Training Centre, and in November, 1959 she was returned to the 2704th Aircraft Storage and Disposition Group at Davis-Monthan AFB. In December 1959 the aircraft was struck off charge and handed over to the Military Assistance programme, from whom she was purchased by the French Government. By the end of the 1950�s the T28A aircraft had been supplemented in primary USAF service by the Beech T34 Mentor and most T28A models entered a period of storage at the MSDC compound at Davis-Monthan AB in Arizona. This aircraft joined many of her type at this facility, but her future was to be changed dramatically by the French Government�s difficulties in their African colonies. The French had been fighting a nasty colonial war in Algeria and had been using a vast fleet of North American AT6G Texan trainers in the ground support role against FLN guerillas. The AT6G was proving to be noisy, slow and vulnerable to ground fire, so the French Government asked their military to search for a cheap and reliable alternative. The French Air Force�s eyes fell upon the North American T28B trainer then in use with the US Navy as an intermediate training aircraft. The B model had been specified by the US Navy, who had found the A model to be under-powered and featured the Wright 1820-76 engine of 1425hp instead of the A model�s 800hp variant. The new engine made the aircraft so capable that the US Navy demanded and received exclusive rights to the production facilities afforded by North American Aviation and this was the situation into which the French Government walked in late 1959. At the same time, the Pacific Airmotive Co of Burbank Ca. received rights from North American to modify T28A aircraft into the civilian NA260 Nomad general purpose aircraft with a 1300hp engine. The first time this variant flew was in late 1959 and a Mark 2 version with a 1425hp engine soon followed. In the meantime, the French Government�s urgent desire to replace the AT6 aircraft made their desire for the T28 insatiable, so they approached the US Government with the suggestion that they be allowed to purchase redundant T28A models for conversion by Pacific Airmotive into B models. The deal was struck and 145 surplus A models were assigned from desert storage to this new programme. In the event, Pacific Airmotive, now known as PacAero carried out the mechanical modifications to the airframe and prepared the engineering data for the rebuild programme which was to be carried out at St Nazaire, where Sud Aviation Company updated the cockpits to French requirements and installed armour etc. The first aircraft (c/n 174-131) (USAF 51-3593) flew in August 1959 and was delivered to CEV at Bretigny AB for trials. It was destroyed in an accident on 16 April 1960 at Cazaux AB whilst on armament trials, and these trials continued with the second machine (c/n 174-289)(USAF 51-3751). 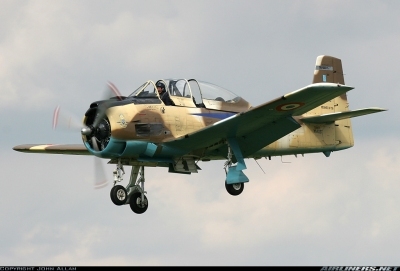 These were successful and the modified T28�s now known as T28S�s and named Fennec (Desert fox) began to be delivered. One hundred aircraft went to Algeria equipping four French Squadrons and immediately proved to be both popular and effective. Their active military careers in Algeria were to be short lived however, as an armistice was declared in late 1961 and the Fennec fleet returned to France. The aircraft were subsequently used in many of France�s colonial possessions most notably in Djibouti and Chad. This particular aircraft was the 119th Fennec to be delivered, and she did not serve in Algeria, but remained behind in metropolitan France for training duties with the Escadrillas D�Aviation Legere D�Appui (EALA) squadrons. Most of her time in the Armee de L�aire was spent on training and liaison duties, and spent a major period in storage at Chateaudun. She was one of the last Fennecs to be retired from the Armee de L�Aire service on 12 October 1967 and the record shows that she was imported into the USA by Waco Pacific Inc of Van Nuys Ca. as N14113 on 12 March 1968. It is understood that the aircraft actually arrived in the USA on 1April 1968. Records show that it was sold to Allied Aircraft sales on 16 January 1970 by the Winter Wolf Company of New York and this company subsequently sold the aircraft to the Haitian Government for their Air Force�s use. It served with the Force Aerianne Haitienne as No 1236 until 1978, when it returned to the USA and was purchased by the Lan-Dale Co of Reno Nevada in march 1978. The aircraft was noted at Tucson in storage in May 1978 and was sold to Jacob S. Kamborian of Nashua, NH in 1984. Mr Kamborian civilianized the aircraft still further and arranged for the aircraft to be registered in the standard category by Hamilton Aviation of Tucson. This company specialized in T28 civilian conversions and had attained US type certification for their T28R model in the early 1970�s. Mr. Kamborian retained the aircraft for many years until he finally sold it to an American Airlines captain Kenneth A. Ferrara on 28 May 1996. Mr. Ferrara offered the aircraft for sale in mid 1997 through Sherman Aircraft Sales and Captain Martin Willing a pilot with Cathay Pacific Airways in Hong Kong, purchased her on 14 October 1997. Martin formed a company called Radial Revelation to own the aircraft and it is now operated under the auspices of John Romain�s Aircraft Restoration Co at Duxford. Painted in a representative French Air Force camouflage scheme of the period, the aircraft has been named Little Rascal and wears a composite colour scheme of some of the various squadrons that operated the aircraft in Algeria. She has remained active on the European air show circuit since then and is still based at Duxford, near Cambridge in 2011. Site designed and hosted by C.I. Web Solutions Limited. © 2010/11 | Site Policy | Get Adobe (pdf) Reader for Free!